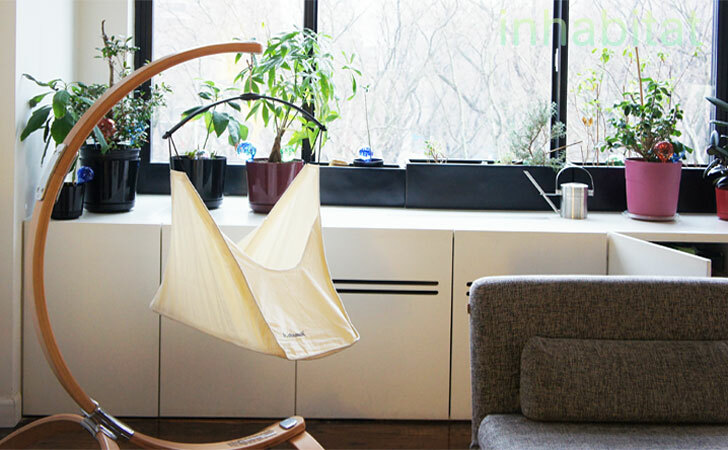 Inhabitots’ editor-in-chief, Jill Fehrenbacher, had a chance to give Hushamok’s gorgeous baby hammock a try with her sweet six-week-old newborn baby. The hammock comes complete with an elegant Okoa stand made from untreated European beechwood and an organic, VOC-free mattress. A stunning piece that will meld beautifully with any room, this hammock also did wonders putting her little one to sleep faster and for longer! (Read: she got a couple of minutes to catch some Zzz’s) You can read more about Jill’s experience using the Hushamok baby hammock over at Inhabitots. Inhabitots' editor-in-chief, Jill Fehrenbacher, had a chance to give Hushamok's gorgeous baby hammock a try with her sweet six-week-old newborn baby. The hammock comes complete with an elegant Okoa stand made from untreated European beechwood and an organic, VOC-free mattress. A stunning piece that will meld beautifully with any room, this hammock also did wonders putting her little one to sleep faster and for longer! (Read: she got a couple of minutes to catch some Zzz's) You can read more about Jill's experience using the Hushamok baby hammock over at Inhabitots.